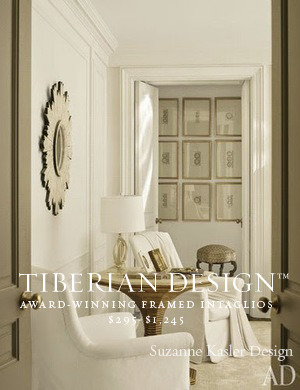 Discover Tiberian's trademark designs through a variety of projects by some of today's best designers. A Collection of Nine Rare Imperial Red Framed Intaglios featured in MARTHA STEWART LIVING. A Set of Four Painted and 23Kt Grecian Framed Intaglios for Nancy Corzine Peninsula Hotel Suite.